2001: A SPACE ODYSSEY MOVIE POSTER R1980 Folded Original 27x41 STANLEY KUBRICK. 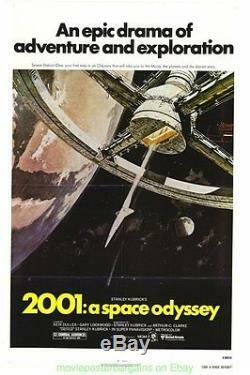 Folded very fine to mint condition American one sheet size 27 by 41 inch rerelease 1980 movie poster of 2001 : A Space Odyssey , the Stanley Kubrick sci-fi classic originally released in 1968 film. I don't sell unlicensed reprints, especially by misrepresenting them as original , all auctions are for theatrical distribution studio issued one sheet size 27 by 40 inch original movie posters unless otherwise noted. For 90% of my auctions UNLESS the rates below are different - TAKE A LOOK!! RUSH ORDERS - LIKE NOT O. ABOUT THE POSTER PHOTO'S. SOME EXAMPLES -A DATE IS CHANGED AT THE BOTTOM OF THE POSTER FOR THE RELEASE OF THE INCREDIBLE HULK BUT THE ONE I SENT WAS THE OLD DATE HE DIDN'T WANT. THE SHERLOCK HOLMES I SENT WASN'T THE ONE THAT HAS HOLMES FOR THE HOLIDAY'S TAG LINE ON IT HE WANTED. I GUARANTEE THE ARTWORK MATCHES THE PHOTO BUT NOT EVERY NUANCE BETWEEN THESE VARIOUS PRINT RUNS THAT THE STUDIO'S PUT OUT - SO THE PHOTO WILL CORRECTLY MATCH THE POSTER'S ARTWORK YOU RECIEVE BUT MAY HAVE A DIFFERENCE IN THE TYPE ON IT. More than just a pretty picture. Make your listings stand out with FREE Vendio custom templates! FREE scheduling, supersized images and templates. Over 100,000,000 served. Get FREE counters from Vendio today! The item "2001 A SPACE ODYSSEY MOVIE POSTER R1980 Folded Original 27x41 STANLEY KUBRICK" is in sale since Monday, March 27, 2017. This item is in the category "Entertainment Memorabilia\Movie Memorabilia\Posters\Originals-United States\1960-69". The seller is "movieposterbargains" and is located in Pasadena, CA. This item can be shipped worldwide.